Rugby League World Cup 2021 today announced a new ground-breaking partnership with Unicef UK who have become the official charity of the tournament. The partnership will use the power of sport to raise awareness and funds for Unicef’s work protecting children in danger around the world. England will host Rugby League’s biggest international tournament in 2021 with the Men’s, Women’s and Wheelchair World Cups staged together for first time. The ‘Inspired by 2021’ programme is multi-dimensional with three key pillars – Volunteers, Facilities and Community Engagement – with the ultimate goal of leaving a positive, impactful and long-lasting legacy. Unicef UK will work closely with tournament partners to deliver core messages and engagement to a global audience, as well as raising funds for vital projects supporting children in the UK and internationally. Jon Dutton, Chief Executive of RLWC2021, said: “Working with Unicef UK will give the sport a powerful platform to help improve economic and social well-being. Unicef is a true global brand and we welcome them to the Rugby League World Cup family who will embrace their goals and programmes with open arms. 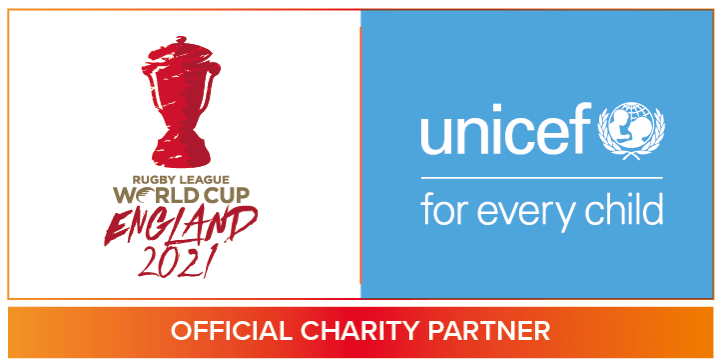 For more information about the partnership with Unicef UK and the ‘Inspired by 2021’ project, please visit www.RLWC2021.com and the official tournament social media channels, on Twitter, Facebook and LinkedIn.